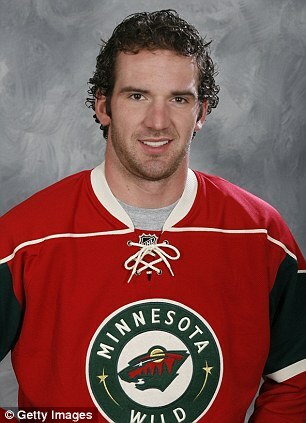 Josh Harding, born on June 18, 1984, is a Canadian ice hockey goalie (#37) for (at present) the Iowa Wild in the American Hockey League (AHL), was diagnosed with MS in late September of 2012. Even with such disheartening news, he was determined not to let it end his career. He began an aggressive course of treatment to stop any new lesions. After which, he was cleared to play. His first game back as goalie of the Minnesota Wild, (NHL), the team won - 1-0 against the Dallas Stars. This same winning attitude is one of the things that has kept Josh fighting his multiple sclerosis. In an interview with Micheal Russo of the Star Tribune, Harding said, "I had a couple of days where I felt bad for myself, but no more. There's things in life that happen. Sometimes you can't explain it. You deal with it." His diagnosis came after several puzzling symptoms, including dizziness and black spots before his eyes. Realizing something was not right, he went to the doctor and was given an MRI of his neck which came back with abnormalities. The doctor called him back for an MRI of his brain, which showed that there were lesions on his brain. He told Josh then that he suspected MS might be the problem. After several more tests ruled out any other issues, his diagnosis for MS was confirmed. Very soon after he was diagnosed, Harding began thinking about setting up a foundation to help people with MS. He was grateful for the help and support he received from his family, friends, and the hockey community - his "team", and wanted to extend this help to others who didn't always have a "team". His dream became a reality when he started Harding's Hope, a charity foundation which raises funds to help people with the high cost of living with MS. According to the National MS Society (The Upper Midwest Chapter), who he partnered with, MS is the second most expensive disease to treat. With a yearly average of $70,000, families sometimes have to choose between treatment and living expenses. If you're a hockey fan, you can Make the Save for MS by donating a penny, a dollar, or more for every save the Minnesota Wild make during a game. Josh says he, "...would like people that have MS not to worry about the decision to either take their medication or put food on the table. If Harding’s Hope can help take away the stress of them not being able to pay their bills, I think that would help them live a more healthy and fulfilling life." Josh missed much of the Iowa Wild's 2014 season, partly due to complications with MS, and partly because of a broken foot. After returning for the second time from his injury toward the end of the year, he was hospitalized in December for dehydration due to MS. While his healthcare team is trying to figure out his latest symptoms, he is being listed by the Iowa Wild as day to day on the roster. Josh Harding is a fighter, and whether or not he comes back to play, is a strong possibility. According to Minnesota Wild, General Manager, Chuck Fletcher, his "...competitive fire has led him to a successful career in the NHL and we know he will approach this new battle in the same manner." "Every one percent counts™ is a guidepost and defining philosophy for Harding's Hope, and its founder, Josh Harding. Harding believes that "every one percent counts" is true in life—and in charitable giving. "If you give just one percent more to your health, by eating healthier, getting enough sleep, and exercising appropriately—whether you're living with MS or supporting someone who is—you'll make a real difference in your life," says Harding. "Every one percent counts also applies to Harding's Hope. If you give that extra amount, we can give people living with MS the critical financial support they need." Every One Percent Counts// Harding's Hope from Chris Wegner on Vimeo. "My goal with this charity is to give hope to people that have MS and let them know that they are not alone. I would like to raise awareness so people understand what MS is and raise funds to support people living with this disease. This hits home to me because I have MS and the more I learn about it, the more I realize how important it is to have a team, to be able to afford to take your medications and treatments, and also to live a happy life." "I don't want people treating me different, I don't want people feeling bad for me, I don't want people moping around. I want this to be a story where when we look back, it was a happy story." Go from Josh Harding back to Famous People with MS I-J.